Now that Halloween has passed, we no longer need the sugar pumpkins to stand around looking cute, so it’s time to get them ready for Thanksgiving. Since this growing season was so wet, all of the winter squashes are fragile and easily spoiled, so they are not storage crops. Use them up! Also, our CSA had a bumper crop of sweet potatoes to harvest (20 pounds per family in one week, OMG!). I had already oven-roasted the pumpkin, not knowing what I was going to do with it, so when some of the sweet potatoes looked like they might not last, a delicious soup was the logical concoction. This soup can be made with pumpkin and/or other winter squashes, including butternut, buttercup, sweet dumpling, Hokkaido, or just about any firm-fleshed varieties. 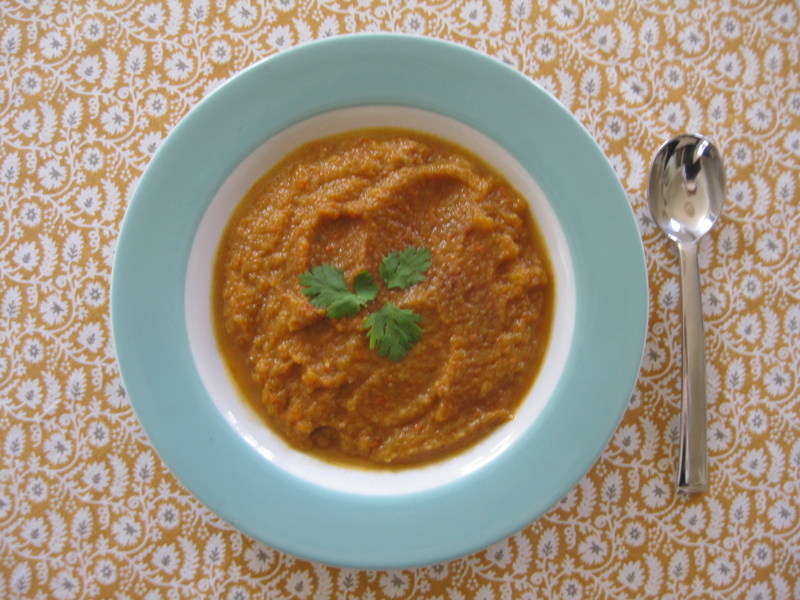 Pumpkin can be pretty weak-flavored and watery, so the sweet potatoes and carrots provide taste and body. Had I thought to make this when I roasted the pumpkin, I would have roasted the sweet potato and carrot too, so that’s what I wrote in the directions. I usually make this soup with water if the squash is really flavorful, or otherwise with vegetable stock, starting with a smaller amount and adding more if the soup needs thinning. It freezes reasonably well, but I don’t add the spices and seasonings until it’s defrosted and ready to be served. Preheat the oven to 375 degrees. Brush the cut sides of the pumpkin or squash with olive oil, salt and place cut side down on a baking sheet. Toss the carrots and sweet potato chunks with olive oil, salt lightly and place on baking sheet. Do not combine them since they typically cook at different rates. Toss a couple of times during roasting to brown all sides. When soft and browned, remove and set aside. When the unpeeled pumpkin or squash is cool enough to handle, scoop out the flash and set aside. Slowly saute the onion and celery in olive oil (you could use butter if you’re using cream at the end) for about 5-7 minutes or until soft. Add the thyme and bay leaf and the reserved vegetables, and stir to coat. Add water or stock and bring to a simmer. Cook for about 25 minutes, or until everything’s fully cooked. Puree in a food processor. Return to pan and season with cinnamon, cumin and cayenne, using the smaller amount and then adding more to taste. Add additional salt if needed, and serve with a little cream or a few snipped herbs if you have some. Makes about 6 servings.